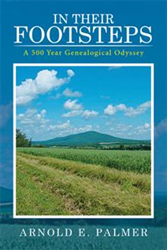 Historian and genealogist Arnold E. Palmer has released “In Their Footsteps: A 500 Year Genealogical Odyssey” (published by Xlibris), a non-fictional rendering of his paternal ancestry that is traceable to both Massachusetts Bay Colony and to New Amsterdam. It is a fascinating account of important historical events as well as topics of human interest like family, survival and the immigrant experience. Part genealogical reference and part historical non-fiction, “In Their Footsteps” serves two purposes: its construction is such that it makes for easy reference to any person mentioned in the book, and two: it tells the story of a formerly wealthy man, who became a Tory during the American Revolution and then exiled himself in the wilderness of New Brunswick in 1783 at the age of 50. Palmer offers his work to historians, history buffs, genealogical researchers and anyone who enjoys non-fiction stories filled with mystery, fascinating events and real-life adventures. Arnold E. Palmer holds a bachelor’s degree in geography from the Syracuse University. He was a member of the American Association for State and Local History, served as president of the Syracuse Macintosh Users Group and volunteer lead site interpreter and assistant curator at the Sainte Marie among the Iroquois historic site.